Today we’re about to multitask, and not the kind where you manage to work and keep up with the latest Grey Anatomy episode at the same time. I’m talking about the type of multitasking that involves snacking and boozing at the same time! This amazingly soft and fluffy vanilla fudge recipe is everything you need in your life right now. Hints of pure vanilla bean, swirls of rich creamy caramel, and a touch of boozy Irish cream will send this recipe to the top of your to-do list! 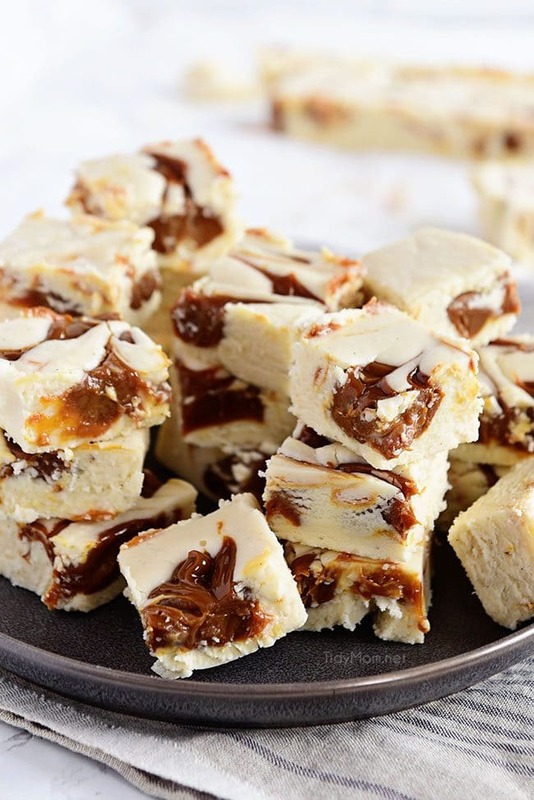 Each bite gets better and better the more time you have to take in every component of this unique yet simple Baileys fudge recipe! It’s sure to be the talk of any party it’s served at! Have you ever been that person too afraid to make fudge because you aren’t skilled enough in the kitchen? That was me once, scrolling through Pinterest drooling over all the fudge recipes, but too afraid to tackle one myself. Well, let me tell you, that fear ends right now because guess what?! This vanilla fudge recipe is actually super simple! Just combine sugar, butter and heavy cream over medium heat. Then attach a candy thermometer and stirring constantly cook until thermometer reads the desired temperature. Lastly, you’ll remove the mixture from heat and add the white chocolate chips, vanilla, and marshmallow creme mixing until well combined. 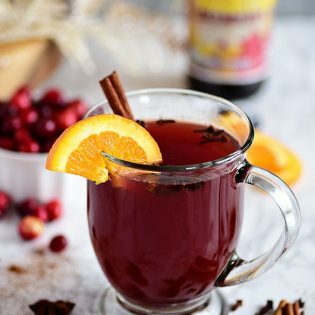 Can I Make This Recipe Without The Alcohol? Of course! Making this vanilla fudge into a recipe the whole family can enjoy is easy as pie! For a nonalcoholic version, substitute Baileys Irish Cream for an Irish Cream flavored coffee creamer. Swapping the regular coffee creamer will not change the consistency or overall flavor the fudge, so feel free to substitute, worry free! When it comes to fudge recipes there’s always a million different ways to switch them up making it your own. 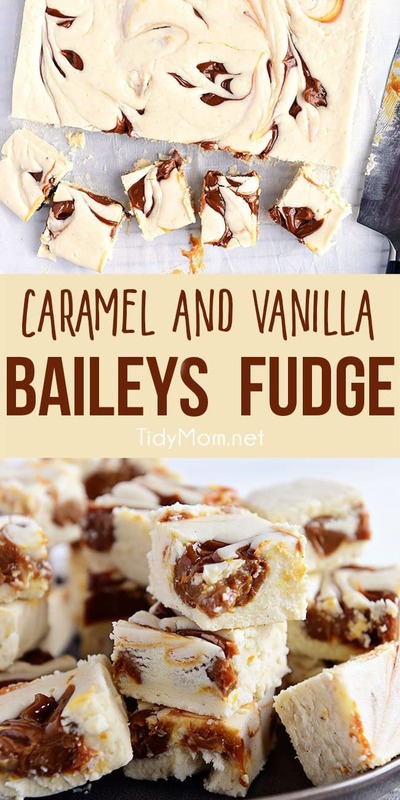 While I absolutely love all the flavors in this Baileys fudge recipe, there’s never too many ways to make one dessert, so here are a few of my favorite customizations. Swap out the vanilla for chocolate. If your more of a chocolate fan than vanilla fudge or you want to have both options available, then just swap out the white chocolate chips, for milk or dark chocolate chips, depending on your preference. Make your own caramel sauce. Make this a completely from scratch authentic fudge and try making your own caramel sauce. 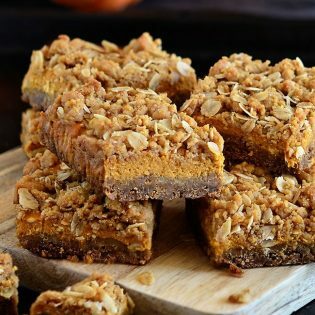 For one of my favorite caramel recipes, head over to this Carmelitas post and find the full directions! Try a flavored Irish cream. The easiest way to switch up this recipe and make it new is to try adding different flavored Irish creams like espresso cream, salted caramel, and vanilla cinnamon. Test the Temperature. The temperature of the fudge is very important if you want it to set correctly, so it’s important to frequently check the temperature while it cooks. The easiest way to do that is what a candy thermometer. If you don’t have one here’s a great resource for how to check your candy without a thermometer. Swirl the caramel. 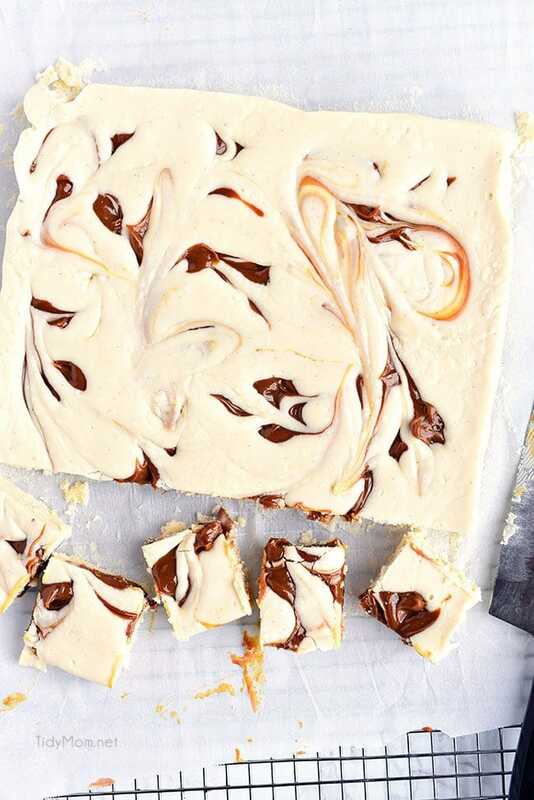 For a look that makes it seem like fudge straight out of your favorite bake shop, grab a butter knife and carefully swirl the caramel making a marbled effect. It’s the easiest way to achieve a professional look without a lot of effort! Freeze it or refrigerate it. This fudge can be cooled in the fridge without any ill effects. It also freezes well, if you want to make it ahead. You can keep the fudge in the refrigerator for up to 1 week, and in the freezer for up to 3 months. 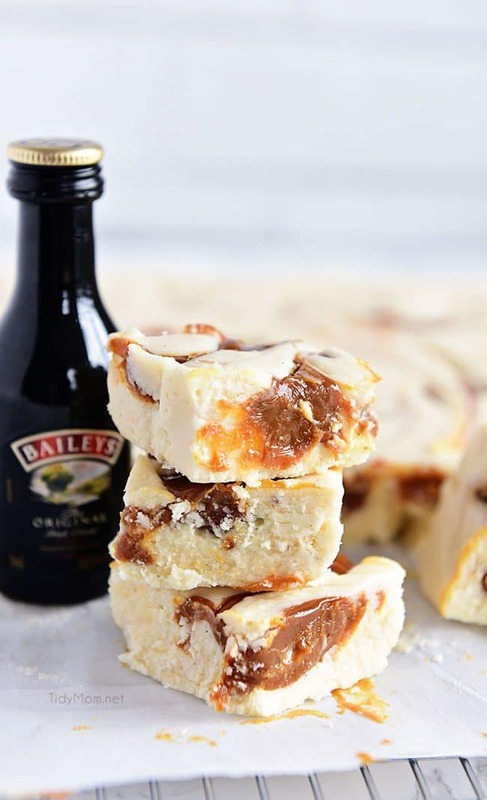 How To Serve A Baileys Fudge Recipe? A quick way to turn this fudge recipe into a cute party treat is to use a fun fudge mold. Whether its the holiday season, St.Patrick’s Day, or just your average birthday party theme shaped desserts are what you need to pull everything together! To use a fudge mold just follow the instructions listed below, but swap the 9×9 in pan for a fudge mold, and pour equal parts into each mold. Another great use for a fudge recipe is to give it as a gift! Put a few squares in a basket with some other goodies, or make it into a fudge wreath for the cutest and most delicious gift anyone will receive all season. Don’t Miss Out On More Irish Cream Recipes! Irish Cream Cupcakes With Chocolate And Caramel Filling Filled with a chocolate caramel ganache surprise. Taken up one more notch with a rich buttercream spiked with a dose of Baileys Irish Cream on top. Irish Cream Cheesecake Parfaits Made with a Baileys infused chocolate and mixed with cream cheese and whipped cream. The texture is perfectly light and airy for this no-bake cheesecake! Dark Chocolate Bread Pudding King’s Hawaiian bread soaked in a rich dark chocolate custard topped with more chocolate before being baked, served warm with raspberry sauce and Baileys whipped cream for a simple yet elegant dessert! Irish Cream Pie Cocktail This easy drink recipe combines Irish Cream, coffee, vodka, and milk and tastes like an Irish Cream Pie…with a shortbread cookie rim! Peppermint Pattie Iced Coffee Enjoy the flavor of cool peppermint and smooth dark chocolate of a peppermint pattie in a refreshing iced coffee! A simple recipe using peppermint creamer. Irish Cream Coffee Bars A luxurious treat to bake this March, or any time of year in my opinion. When you bite into this decadent dessert your teeth sink through, not one, but two layers of robust sugary bliss. 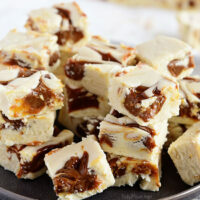 Like this Baileys Fudge Recipe? Pin It! You know what they say, you miss 100% of the fudge recipes you don’t make! So with that being said, don’t miss your shot at enjoying the most amazing treat you’ve had in a long time! I can’t wait to hear how much you love it! 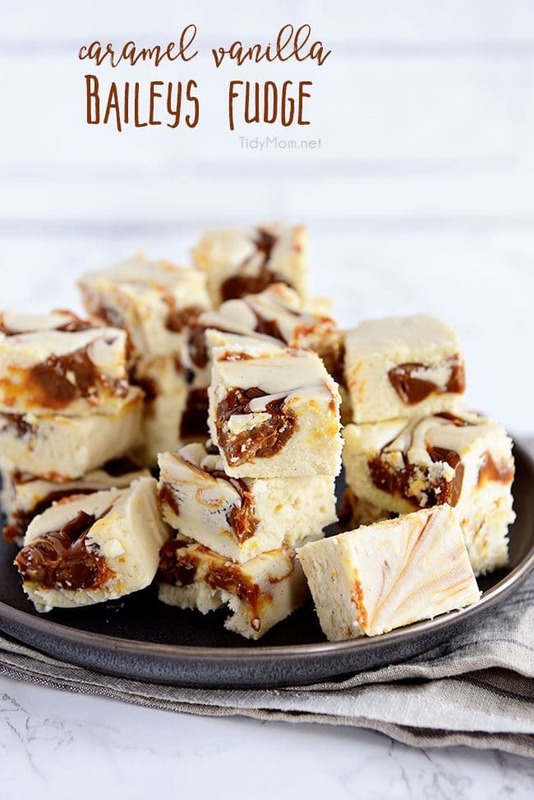 This boozed up Baileys Fudge Recipe has the perfect balance of vanilla bean and Irish cream with a sweet caramel swirled in! This vanilla fudge is easy to prepare and turns out super creamy. Line a 9-inch square pan with foil and lightly coat with nonstick spray. Remove from heat and add the white chocolate chips, stirring quickly with a wooden spoon or spatula until the chocolate has melted and the mixture is smooth. Add vanilla and marshmallow creme and mix until well combined. Pour mixture into prepared pan and set aside on a wire rack. 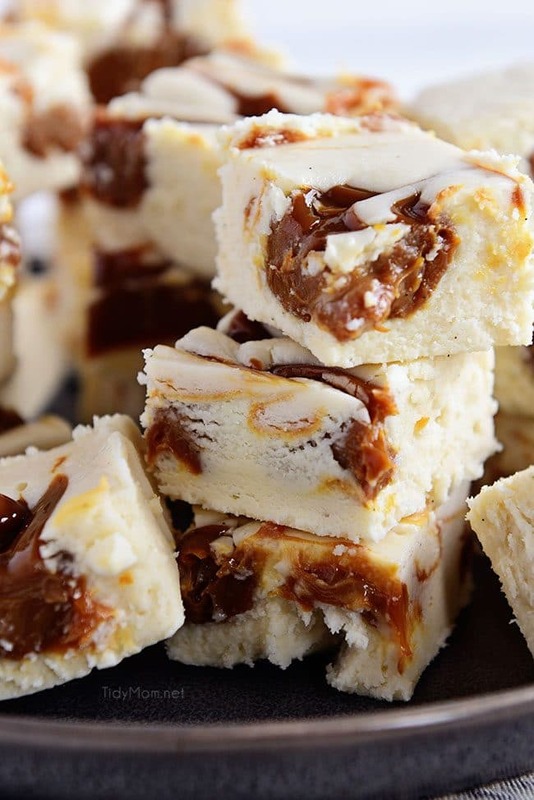 In a medium-small glass bowl, heat Dulce de Leche in the microwave to 15-20 seconds to soften. 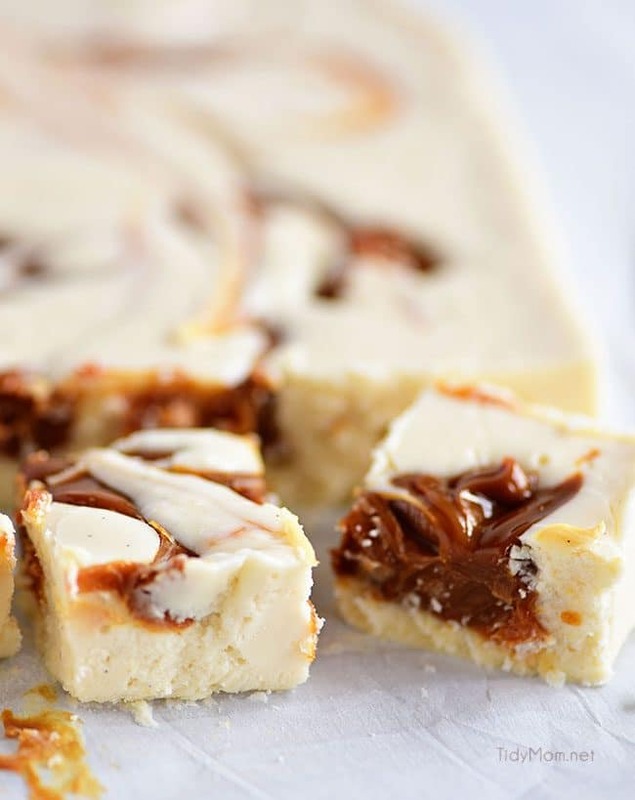 Drop dollops of softened Dulce de Leche around the top of warm fudge and swirl through with a butter knife for a marbled effect. Allow fudge to cool on wire rack until room temperature. Stored in an airtight container or wrapped, at room temperature, or in the refrigerator for up to one week. This fudge can be cooled in the fridge without any ill effects. It also freezes well, if you want to make it ahead. For a nonalcoholic version, substitute the Baileys Irish Cream for an Irish Cream flavored coffee creamer. Once you start eating this fudge you can’t stop! Hands down THIS is my new favorite fudge recipe. 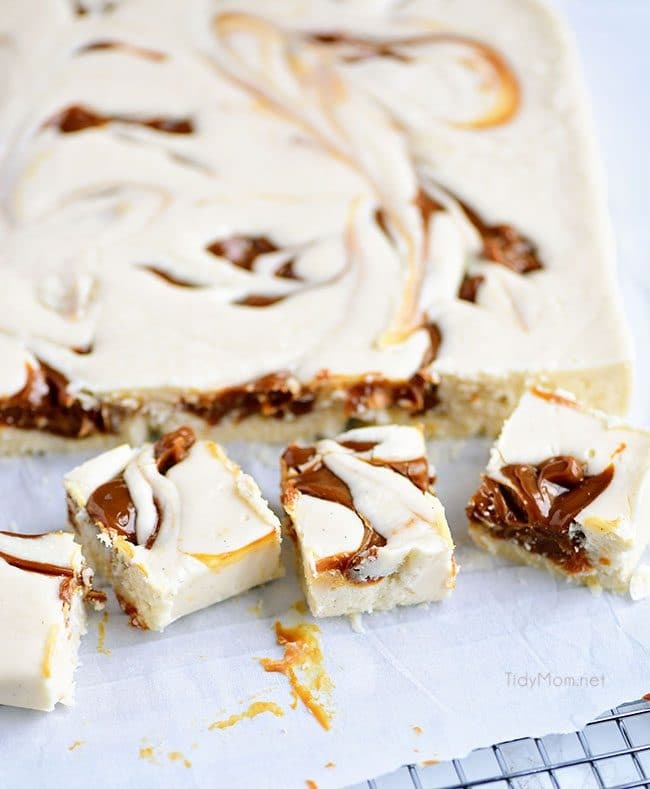 Swooning over this fudge idea! We love Baileys! This looks amazing, and I love the flavors! But, did I miss where you add the Baileys? I don’t see that in the instructions… Can’t wait to try this, but I sure don’t want to make a mistake! Thanks! Thanks catching that Jane!! We fixed the recipe 😉 Enjoy! Superb article. Really fantastic & yummy as well. Keep going. Thanks a lot for sharing. Wish you all the best. I just drooled onto my keyboard. Hope no one saw that.